The Uttar Gujarat Vij Company Limited is handling the recruitment for Technical posts. In the recent announcements made by the placement cell, there will an online test be held for 292 positions of JA, Junior Engineer (Civil and Electrical). It is time to stay awake as the data essential with respect to the conduct of event is regularly updated online. 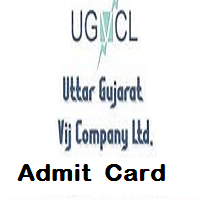 The UGVCL Vidyut Sahayak Admit Card 2018 can be downloaded from a helpful link provided at the end of this section. Please find out more noteworthy details that are important from the exam’s point of view. In the recent advertisement, the posts are to be filled relates to the technical departments only. Filling 292 vacancies for Junior Engineer, Jr. Assistant for Electrical and Civil Stream, appointment procedure shall be completed with a conduct of online exam and interview. All those who applied for these posts and are waiting to get an updated piece of information on the same are advised to read this article which is based on the news pulled out from trusted sources. Some concerning points to keep in mind while downloading UGVCL Vidyut Sahayak Admit Card 2018 are the details about venue, date and day of a test, the Reporting time, Centre Code, Paper Code, and details regarding the candidate. Examinees must also be aware of the upcoming notices issued in regard by the paper. List of candidates to appear in the Online Exam JE Electrical – Verification. List of candidates to appear in the Online For JE Civil – Verification. Since this is a direct recruitment, the contestants have to qualify the stages of selection so as to be eligible to take on these jobs. As a compulsory measure, the authority shall undertake the arrangement of this state-level competition. The selection test to be held is going to be an objective type exam having Que came from basic aptitude and from the professional background. There will be different exam patterns for Junior Engineer and Vidyut Sahayak exams. For both papers, details have been curated in the tables represented below. There will be negative marking as per recruitment rules. The test shall be objective type and will be in more than one language (Hindi/English/Gujarati). Please keep an original identity proof along with UGVCL Vidyut Sahayak Admit Card 2018 while entering the examination premises and hall. Contestants are advised to recheck dates, Reporting Time, Venues details, and other important things prior to the exam and so to avoid any ambiguity. Latecomers are denied entry to the premises, thus contenders are instructed to reach the venues as told through their respective hall tickets. Everyone related to this exam needs to reach www.ugvcl.com Electrical, Civil and locate the Career panel on the homepage. Look for an authenticated link and postcode or advertisement number. Follow it further and login to candidate’s form. Put your login info and print your ticket after verifying your details such as Photo and Signature. Keep a copy of your pass secure to use is in the future. It is necessary for the aspirants to remain on the internet while the official updates are being formed and dispatched by the regulatory body. Hopefuls need to keep in touch here to avail all the noteworthy alerts. Get to the authenticated web portal using these guidelines provided here and use help from a link that is mentioned beneath this passage for UGVCL Vidyut Sahayak Admit Card 2018. Put your queries and suggestions in the comments box if you have any.